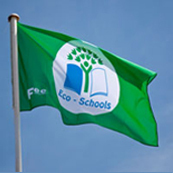 Greenbank Preparatory School is delighted to have been awarded the prestigious National Eco School "Green Flag Award", the highest accolade celebrating commitment to environmental awareness. The "Green" theme has become an integral part of our school life and is driven by the Eco Council which comprises pupils, staff and parents. Children are actively encouraged to promote Eco ideas and action plans to benefit not only the school but also the wider community. In 2014 we were presented with the Independent Schools Association "Green School of the Year" award - in recognition of the efforts and achievements of the whole Greenbank family.